Dirty Lamb skincare. I have been using their Coffee Scrub and Lip Rockz. The entire line is natural, cruelty free, vegan, and unisex. The Lip Rockz is my favorite. It is a gentle scrub for your lips, that tastes delicious. It will remove dry flaky skin and leave your lips smooth and supple. It uses 100% Arabica coffee beans to provide full body exfoliation. It buffs away dead skin cells on the face & body, leaving your skin smooth and soft. The coffee is Marley Coffee derived from Ethiopia. It stimulates the lymphatic system, combats cellulite, and is said to be an aphrodisiac. It also uses hemp seed oil and coconut oil. Your Mask. Beneath Your Mask is a “skin, body, and hair rejuvenation line designed to restore, repair, and reverse the toxic effects of environmental hazards, health challenges, stress, and the damage done from countless other unforgiving aspects of our lifestyles.” The line is all natural, cruelty free, gluten free, gmo free, paraben free, sulfate free, phosphate free and Toxin free. It is hand-crafted in small batches and sealed in violet-colored glass packaging that harnesses specific light rays to increase the energy level of each product. I have been using the Heal Whipped Skin Souffle and Polish Detoxifying Body Scrub. Heal contains anti-bacterial, anti-aging and antioxidant properties. It leaves skin deeply hydrated. Polish draws out toxins from the skin, removes dead skin cells and deeply exfoliates It is calming, soothing, and moisturizing. So get Beneath Your Mask, to get your skin ready to bare it all…. I LOVE A HOT AUSSIE…. 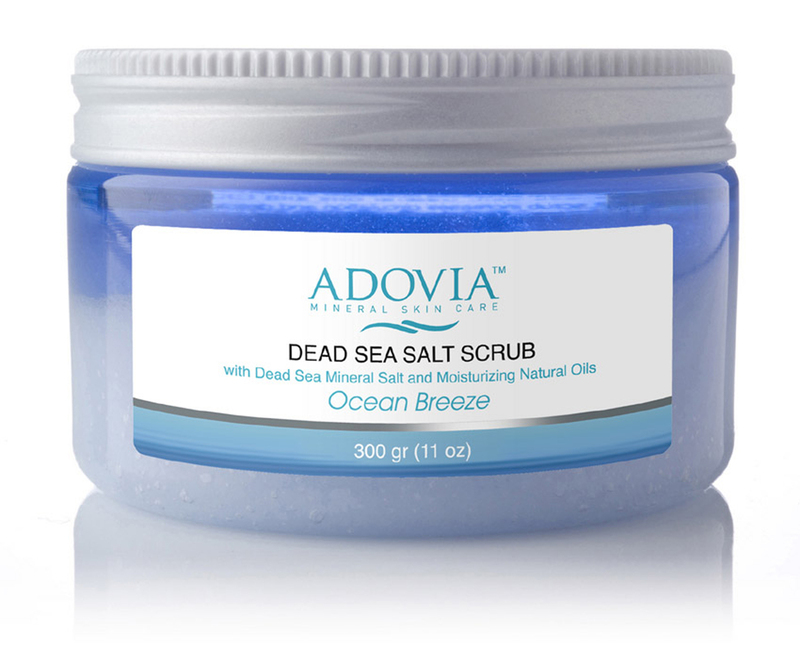 exfoliating with Adovia Mineral Dead Sea Salt Scrub. It gently exfoliates dead skin cells while deeply moisturizing with various oils. The scrub is made from dense salt and minerals of the Dead sea. It is said to ease muscle aches and pains and heal many skin conditions. Avocado Oil, Sweet Almond Oil, Aloe, and Jojoba oil hydrate and heal. So scrub up in the shower and get silky smooth for after….